My brother was visiting for Valentine’s Day and we were having dinner at home. Valentine’s Day, of course, calls for a chocolate dessert of some kind and this brownie recipe fit the bill for recipe number 6 in the 52 week new recipe challenge. This recipe was adapted from a Barefoot Contessa recipe. Originally, it calls for the use of smaller cast iron skillets but last year’s road trip found us in South Pittsburg, TN, home of the Lodge Cast Iron Outlet Store where I purchased these 6″ skillets. While the recipe says it makes 5 servings, using larger skillets yielded 2 skillets but you could still get 4 – 5 servings either sharing or with leftovers. A longer cooking time is required if using the larger skillets. Top with ice cream, we used vanilla but mint chocolate chip, vanilla fudge swirl, peanut butter or your favorite would also be delicious. A little Hershey chocolate syrup makes it all the more decadent! In a medium bowl, sift together 1/4 cup flour, baking powder and salt and add to the chocolate mixture, stirring until just combined. In a small bowl, toss together the remaining 1/2 cup chocolate chips and one tablespoon flour and fold them into the chocolate mixture. Divide batter into two 6″ cast iron skillets or five 3 1/2″ cast iron skillets. Place on baking sheet and bake 25 – 35 minutes (depending on skillet size), taking care to not over bake. 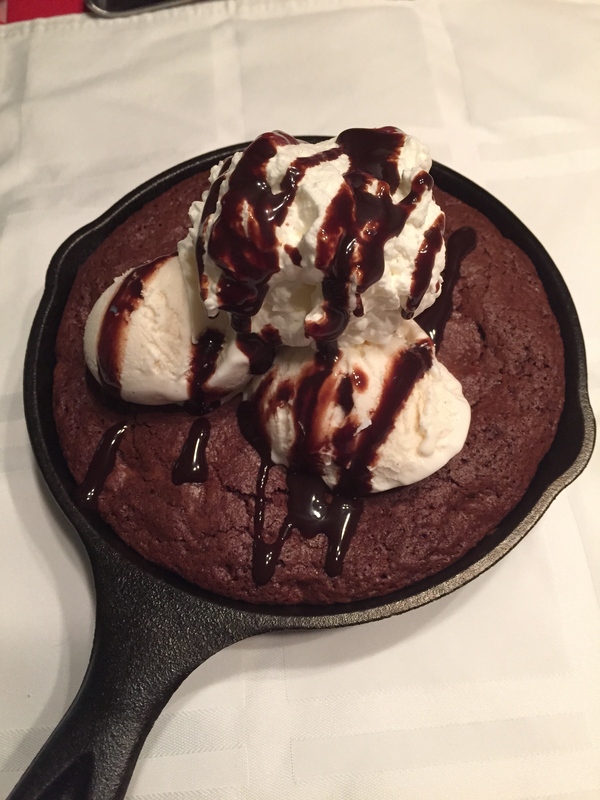 This entry was posted in 52 Week Challenge, Comfort Food, Company Worthy, Desserts, Entertaining, Father's Day, Kid's Favorites, Mother's Day, Sunday Dinner, Valentine's Day and tagged brownies, cast iron, chocolate, Chocolate chips, unsweetened chocolate. Bookmark the permalink.